You've probably seen the Pink Floyd prism graphic from the cover of "Dark Side of the Moon" hundreds of times in your life. It's been featured on t-shirts, lunchboxes, backpacks and billboards. It's been parodied, reimagined, and redesigned, even by the graphic's creator for the 30th-anniversary re-release of the "Dark Side of the Moon." In many ways, it's become more recognizable than the band's actual graphic logo. The album itself has sold over 50 million copies worldwide and nearly 30 years after its release, it still holds the record for most weeks spent on Billboard's Top 200 album chart, at 736 weeks! And even though it was only ten tracks long (many of them highly conceptual), it is consistently ranked as one of the best albums of all time. As iconic as "Dark Side of the Moon" is as an album, even people who have never actually sat down to listen to it can point to the Pink Floyd prism and be able to tell you where it's from. It doesn't have the band name, the album title, or any description. It doesn't even have a picture of the moon, and yet people will instinctively say "Dark Side of the Moon" when they see it. So what's the story behind that simple, yet enduring design? If you've ever wondered about the person behind it, and how he created one of the world's most recognizable album covers, we've got the story here! "Dark Side of the Moon" was Pink Floyd's eighth studio album and the seventh featuring album art by legendary graphic artist, Storm Thorgerson. Thorgerson created some of the most iconic album art of the last five decades, working with over 100 different world-famous bands, and designing hundreds of album covers, none more memorable and recognizable than his art for "Dark Side of the Moon." But Thorgerson was known and sought after for a very different style to what ended up being on the cover of "Dark Side of the Moon." He was primarily known for creating surrealist photographs and pictures and hadn't done any graphics prior to that album. "Could We Not Have One of Your Funny Pictures?" In fact, it was a conversation with Pink Floyd's keyboardist, Richard Wright, that led to the shift in style. "Dark Side of the Moon" is a highly conceptual album, and quite different from the rest of Pink Floyd's discography. As such, Wright wanted the album cover to reflect that change and showcase something very different, something "smarter, neater, and more classy." Storm told Rolling Stone in a 2011 interview that Wright approached him after he had listened to the album and said, "Storm, let's have a cool graphic on the cover. Could we not have one of your tatty, figurative pictures?" Thorgerson explained to him that he did pictures, not graphics. To which, Wright said, "How about a change? Something simple and bold. Why don't you try to see it as a challenge?" According to Thorgerson, they took all of three minutes looking at the designs but were completely enamored with the prism, refusing to consider the others or hear any further explanation of the significance of the design before they were back in the studio to continue recording. Guitarist, David Gilmour, said in a 2003 interview that he just thought the design was very commercial and would look great in a record shop window. Gilmour and the other members of the band strongly disliked having photographs taken of themselves for album covers, because they ended up looking like "vague pictures of four lads bouncing in the countryside." According to Thorgerson, there were two parts to his design of the Pink Floyd prism. The first part was the light which passes through the left side and turns into a rainbow spectrum of light from the right side. Thorgerson used this aspect to relate to the psychedelic laser light shows that Pink Floyd was famous for at their live concerts. According to Thorgerson, they hadn't really had a way to celebrate their elaborate light shows outside of their live concerts up to this point, and it was something he always enjoyed about their performances. 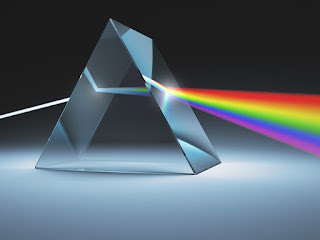 The second part of the Pink Floyd prism design was the prism itself, the triangle. Thorgerson said that the triangle is a symbol of thought and ambition, which was very much representative of Roger Waters' lyrics for the album. The combination of the two concepts was very representative of Pink Floyd as a whole, combining the symbolic icon for thoughtful and ambitious lyrics with a representation of the psychedelic sounds and visuals that the band was known for. Thorgerson's original design for the cover was very different. Though no remaining copies exist of his original drawings, Thorgerson initially wanted to the album cover to feature a photographic version of Marvel Comics' "Silver Surfer" in front of a multi-tiered ocean wave. This design, he says, was very representative of the fans and their relationship with the band. But his conceptual drawings were turned down, and the band was given seven different possible designs instead. All four members of the band unanimously agreed that the prism design was the best by far. Would the world have been as obsessed with the album nearly as much if it had featured a silver-painted man on a surfboard instead of the prism and rainbow? Thankfully, the band made sure we'd never have to know the answer to that question. Sometimes the concept of a design just comes together naturally and fires on all cylinders. For Storm Thorgerson and Pink Floyd, that was the "Dark Side of the Moon" album cover art. Conceptually, it's a perfect representation of the music of Pink Floyd at its most basic level. It hits the notes of progressive rock and psychedelic visuals while remaining simple and bold. But it is also symbolic of the thoughtful and ambitious production of the music and lyrics, especially for "Dark Side of the Moon."